This was Queen’s first album recorded digitally. This was Queen’s last album with a promotional tour. All four band members were credited as songwriters for the song “One Vision”, however Roger Taylor stated in an interview with Australian TV that originally it had been his song, with serious lyrics about men like Martin Luther King, but joked that "that rotter Freddie" had changed all his lyrics with additions like "one shrimp, one prawn, one clam, one chicken" and even name-checking bassist John Deacon. 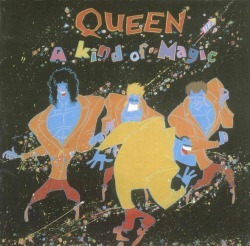 Mercury changed the lyrics in the song “A Kind of Magic” when Taylor was over in LA for a week.